This May, King George’s Hall presents an exciting new live-action version of the incredibly successful animated TV series, Sarah and Duck. Featuring a host of wonderful characters from the BAFTA Award-winning CBeebies show, embarking on a brand new adventure: Sarah and Duck’s Big Top Birthday. Join Sarah and Duck, along with all their favourite friends, including The Ribbon Sisters, The Shallots, John and Flamingo and Umbrella, as they plan a circus-themed birthday party for Scarf Lady in their garden. But when the weather turns windy and the big top is blown away, will Sarah and Duck be able to save the day? 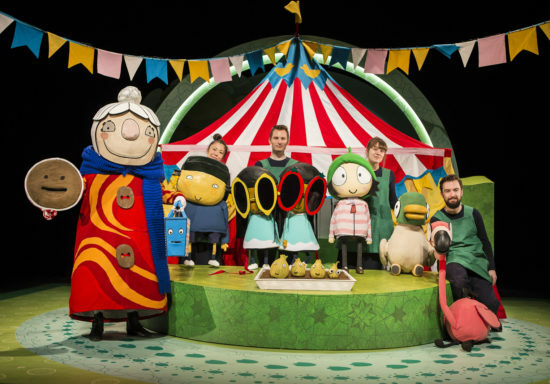 Told through a fantastic blend of inventive puppetry, charming storytelling and toe-tapping music, Sarah & Duck’s Big Top Birthday will take families and children on a magical theatrical adventure.